Ceiling fans circulate the air in a home to improve comfort. Over the patio, a ceiling fan will keep flies away while you eat. In the bedroom, a ceiling fan feels cool and comforting after a day in the hot sun. Wherever you install them, ceiling fans add value and appeal to a home, but not all homes are wired for them. 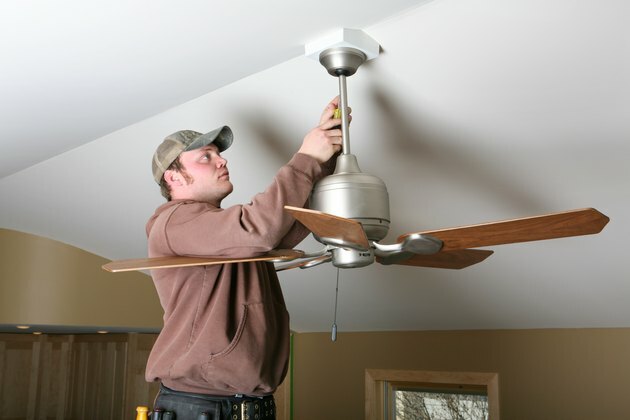 This article will show you how to install a ceiling fan where there is no existing light or power. The first thing you need to do when you are adding a ceiling fan to a room is decide where you want your fan. Use a stud finder on the ceiling to see where the joists are and which way they run. The electrical box for your fan will need to be securely mounted to a joist or to two joists if it is placed between them. Make sure the electrical box you use and any support bar are designed for use with ceiling fans. You need a box that will hold up to the weight and vibration. You do not want to install a ceiling fan without wiring. So when you don't have the wiring, you'll have to install the electrical box yourself. Decide where you will be getting power for your fan. You can pull power from an existing circuit, but if you are not sure if the circuit is overloaded, then you should probably run a new wire to the electric panel and install a new breaker. That way, when you need to add other fixtures, you have a partially loaded circuit easily accessible from the attic. Decide where you will put the switch or switches. Use a stud sensor to make sure that spot is between the studs and to check for existing wiring in the wall--many stud sensors will detect wiring in the wall. It's recommended that you wire for two switches. One switch is for the fan and the other switch is for the light attachment. Even if you don't plan to add a light now, run the wire for a second switch. The cost to install a ceiling light fan switch isn't much and can save you a lot of work in the future. Mark and cut the holes for the electrical boxes, but don't install the boxes until the wires are run. Some boxes come with templates. If you don't have a template, try tracing around the edges of the electrical box with a pencil. Use the keyhole saw or a sharp sheet-rock knife to cut the holes. After you've shut off the power, run the wire from the electrical panel or other power supply you'll be using to the fan. Use 14-2 wire, with ground, unless you are tapping into a 20-amp circuit. In this case, all of your wire should be 12-gauge. Run a 14-3 wire with ground from the fan to the switches. You could run the wire from the panel to the switches, but you make it easier for any future wiring if you run the line from the panel to the box in the ceiling. Leave at least 6 to 12 inches of wire hanging out of the hole at each end. At the panel, you want to leave enough wire to hang two or three feet below the panel. Strip the ends of the cables, leaving about a half-inch or more of cable insulation protecting the point where the wire will enter the electrical box. Do not cut into the insulation on the wires inside the cable sheath. Pull the wires into the electrical boxes, and mount the boxes into the ceiling and wall, according to the manufacturer's instructions. Take a look at the box in the ceiling and make sure it is sturdy enough to hold a heavy, vibrating fan. Do not run the power wire into the main electric panel or other power source until you have done everything else. If you used metal boxes or if your box has a ground screw, connect a green or bare #14 copper wire about six inches long to the box. The other end will be connected with a wire nut to the other ground wires later. Prepare the switches. Connect two 6-inch pieces of bare copper wire or green insulated wire to the green ground screw on each of the two switches. Connect a 6-inch piece of black-insulated wire to one side of each of the switches. You can do this by stripping about an inch off the end of the black wire and connecting it to the screws on the side of the switch or by stripping about a half-inch off the end of the black wire and pushing the stripped end into the push-in connections. If you don't use the screws, tighten them all the way in to minimize risk of short-circuits from the screws contacting the electrical box or another wire. Use black electrical tape to wrap the entire length of the white wire in the switch box. Use a wire nut to connect the ground wires from each of the two switches and the one from the box (if applicable) to the bare copper ground wire from the 14-3 cable from the fan. Strip about a half-inch of insulation from the exposed ends of each of the insulated wires (a black one, a red one and a white one that has been taped black from the 14-3 cable and two black wires from the switches). Connect the three black wires together with a wire nut. Connect the taped white wire to the opposite end of one of the switches from the black wire. Connect the red wire in the same way to the other switch. Fold the wires into the electrical box as you push the switches into place. Use the screws at the top and bottom of each switch to hold the switches in place and to pull them in until they are flush with the wall. Place the cover plate over the two switches and screw it into place. Use a ladder to get to the electrical box for the fan. Use black electrical tape along the entire length of the white wire from the 14-3 cable, so the white insulation is no longer visible. Strip a half-inch of insulation off the end of all insulated wires in the box. Assemble the fan according to the manufacturer's instructions. Attach the holding fixture for the fan to the electrical box per the manufacturer's instructions. Hang the fan from the holding fixture. Connect the grounds. There will most likely be a black wire, a white wire, a blue or gray wire, and a bare copper or green-insulated wire emerging from the top of the fan. There may also be a ground wire from the holding fixture. Connect all of the ground wires (from the fan, from the holding fixture, from each of the two cables and from the box if applicable) together using a wire nut. Connect the white wire from the fan to the white wire from the 14-2 power-supply cable. Connect the black wire from the 14-2 to the black wire from the 14-3 cable. Connect the white wire that is taped black from the 14-3 cable to the black wire from the fan. Connect the red wire to the blue or gray one from the fan. Then install the cover and finish installing your new fan. Run the 14-2 cable into the panel per electrical code (using a 3/8 inch Romex connector). Strip the cable sheath from the wires back to just inside the connector. Connect the ground wire to the ground bus with all of the other ground wires. Connect the white wire to the neutral bus (this may be the same as the ground bus). Ensure the breaker to be connected is turned off. Connect the black wire to it. Install the breaker into the panel. Close the panel, then turn on the breaker. Test the fan to make sure it's properly connected. When you're installing a ceiling fan, you will be working in an energized electrical panel. To stay safe, shut off the electricity to the panel while working.